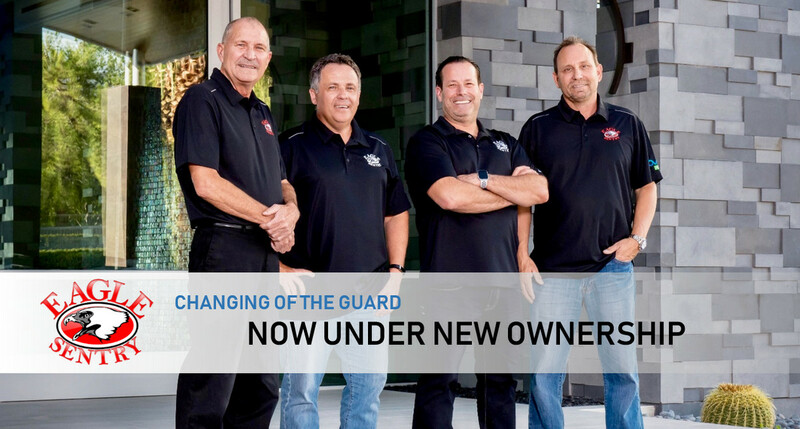 Greg Simmons and partner have sold their Las Vegas security and home-automation firm Eagle Sentry to long-time sales manager Cory Reif and top client Mark Lindsey, whose home is "the greatest showroom on Earth." Eagle Sentry co-owners (from left) Ray Ladesic and Greg Simmons sell their $9 million security and smart-home business to sales manager Cory Reif and customer/investor Mark Lindsey. Eagle Sentry, a $9 million security and smart-home integration company based in Las Vegas, is being sold. Majority owner and long-time president Ray Ladesic has retired, and the face of the company, vice president Greg Simmons, will ease out of the day-to-day operations. Both sold 100 percent of their shares to friends of the business. One of the new 50/50 owners is Eagle Sentry sales manager Cory Reif, who joined the company in 1991 as a runner and will take over as president. The other, Mark Lindsey, is a long-time customer who engaged the firm for the first time about seven years ago and has used them ever since – most recently for his massive new high-tech home in the Las Vegas area. “He’s our biggest and best client,” Reif tells CE Pro, adding that Lindsey has been intrigued with the home-tech industry throughout the home-building process. Expansion plans are key. Lindsey is going to make a “big investment” in Eagle Sentry, says Reif, enabling the company to upgrade its own technology and expand the business locally, as well as outside of the Las Vegas area. With this nice new infusion of cash, Eagle Sentry has plenty of ways to grow. First, Reif plans to get his own house updated – that house being Eagle Sentry, which has let its IT and software systems slide while serving the technology needs of its clients. “Even though we’re a tech business, we’ve let our software become antiquated,” says Reif, echoing a common sentiment among busy firms that don’t make time for their own self-improvements. With Simmons, Reif had been working with a third-party provider to integrate disparate business software into one unified platform, starting with field-service management. With about 50 full-time employees and more than 530 projects per year, Eagle Sentry needed a better way to track and manage labor. Reif says the company will be the first in the low-voltage industry to implement a productivity suite typically used by electrical and HVAC contracting companies. 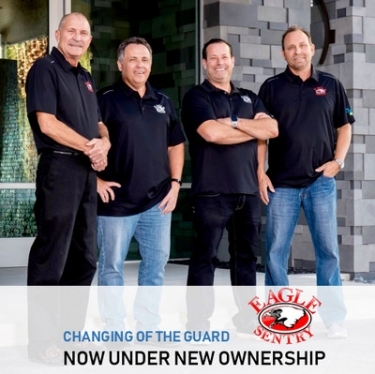 With greater internal efficiencies, Eagle Sentry will be in a better position to expand, both locally and outside of the Las Vegas area. The company is somewhat unique in the home-tech channel, pursuing both high-volume security and smart-home jobs, as well as ultra-custom A/V and automation projects for celebrities and other well-to-do clients. Reif sees growth potential in both sectors. Much of the company’s high-volume work comes from production and semi-custom homebuilders, some of which are expanding into other territories, according to Reif. He suggests Eagle Sentry might follow these customers to their new home developments. Most home-tech installation companies grow slowly, organically – adding more product lines, markets and customers. Some merge with local competitors. Others add remote offices. Only a very few have tried to merge on a large scale, but these so-called roll-ups inevitably flop. Either the outside investor gets skittish or the companies (and personalities) become too difficult to merge. Greg Simmons (right), the face of Eagle Sentry for 22 years, and a regular industry spokesperson, looks to the new owners for new energy. Eagle Sentry was founded in 1986 as a home security and monitoring company. Ladesic and Simmons purchased the firm in 1996 and extended the practice into A/V and home automation. Today, security is still a key component of the business, with “thousands” of monitored accounts generating cash flow to benefit the entire organization. “Every year, we expand into new areas and every year we get a little better at what we do,” Reif says. With that in mind, Reif says he brought an opportunity to Eagle Sentry’s owners about a year ago to expand into a nearby market, but the company was already “firing on all cylinders and overbooked with projects.” So they passed. Reif, who says he couldn’t let go of the opportunity, called Lindsey for guidance and the duo put together a plan to buy out the existing owners. They acquired the company in an all-cash deal based on a "standard" multiple of EBITDA. After 22 years as Eagle Sentry president, Ladesic was already planning to retire, and Simmons had been increasingly active in Parasol, a tech-support outsourcing firm he co-founded earlier this year with two like-minded integrators. Simmons will personally put more energy into that venture, while continuing some business-development functions at Eagle Sentry “for as long as we can keep him,” Reif says. For its part, Eagle Sentry has signed “almost every single one of our high-end clients” to the Parasol service, and the results have been “phenomenal on our end,” according to Reif. He says Parasol has helped the company reduce service rolls, increase efficiencies, and provide better customer support. 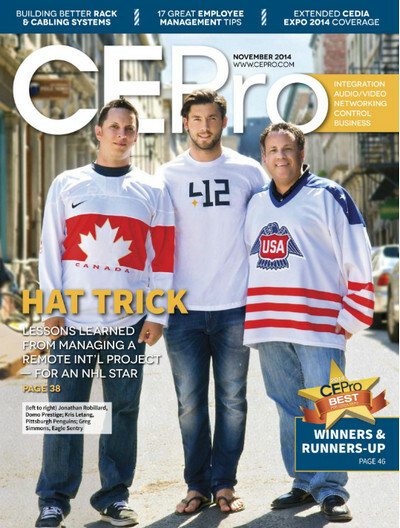 Simmons tells CE Pro he looks forward to the next chapter of his professional life, and he’s particularly heartened to leave the company to such passionate owners. “What Cory and Mark bring is a ton of new energy,” Simmons says.